I’d like to do a full post on how I plan in the kitchen but today I want to talk about a few tricks that can eliminate the need for trip to the grocery store whether or not I have kids in tow. Your ally? A well stocked pantry and mine is. I began thinking about this several years ago when Michele Scicolone wrote The Antipasto Table. Michelle began a list – some of which I agreed with and that I’ve added to. I set out to write my top ten and frankly, I keep coming up with more; spices, rice, sauce, stock – my list goes on. Regardless of what’s on the list, I’m hoping for a robust dialog since I recently learned that “grated beets” are on the list of The Only Cin. Beans – Black, red, white, green, small, round, large, local – you name it. Maybe just out of deference to the two years that I lived on nothing else, I keep an ample variety on hand. See how the pintos are growing on a Colorado Farm. Stock and Broth – Broth is such an easy thing to make from vegetable peelings and onion tops. Freeze it. Freeze it in ice cube trays if you only use a little at a time. If you eat poultry or other meat, boil the bones and make stock. By the way, that is the technical difference between those two terms even though they’re used interchangeably. Stock is from bones. Capers – They’re not local but I’m in love with them. Where do they come from? They are the unopened flower bud of a Caper bush. Each bud is picked by hand in the early morning hours before it can open. After sun drying, they are pickled in a vinegar brine. Julia Child suggested replacing half of the brine with vermouth to improve flavor. Garlic – If you don’t use it up when it’s fresh, there are several ways to preserve it. Although it gets a bit mushy, frozen garlic retains all the flavor. Many people attempt to store it in oil, which again, is okay as long as you use it up. Otherwise freeze it in the oil also. For those with a dehydrator, garlic dries beautifully. Anchovy filets – I recognize I lose the vegans on this one but I adore these little creatures. They melt perfectly in olive oil and add such a salty rich flavor to sauces or just olive oil. So many people tell me that they don’t like them yet they have no idea how often they’ve consumed them in my kitchen. Parmesan – I wish I could remember who first suggested to me that I save the rinds and use them in soup but I’m going to credit Maggie at Whisked Away. Olive oil – Whenever I travel to the far Southeastern part of our metropolis, I dash by the olive place. We use so much of this fruity substance that it’s often on the shopping list. Olives – Same story, second verse. Although I have five olive trees and have put them up, I love that our local grocery has an olive bar. Chopped with pasta, rice, veggies, on bread. Mmmm. Frozen fruit – This is for smoothies and fun fruit drinks for the kids. Nuts – Pecans, pistachios, almonds and pine nuts are local for us but I do love most varieties. We’re fortunate not to have nut allergies in our home. I love nuts in salads, in rice, and on the off chance that I bake something, I put them there also. What’s on your list that might be a key contributor to developing a dish or a meal that gets you through a crazy day? •Canned tomatoes, especially fire roasted, which adds a depth to dishes you can’t get otherwise. Tomatoes are a base for so many dishes and a quick spaghetti sauce is just a few herbs away. •Lemon rind peelings. Whenever I squeeze a lemon, I first grate a bit of the rind and freeze it. It’s great added to soups, hummus, baked goods or even tea. Great additions Lisa. I agree with both although haven’t frozen lemon rinds. Will do in the future! Beans, broth, garlic, and nuts, oh my! Add a slow cooker, dehydrator, and VitaMix and almost anything becomes possible with our season veggies. Yes, but we’ll save that for a post on the top ten tools! Love this list, Tammy! I love the tips about the capers and parmesan. Great suggestions! And I agree with Lisa–canned tomatoes are an essential pantry item for me, too. Thanks for reading Renee. The parmesan thing is a wonderful trick. I can’t believe I didn’t know it sooner. Great list. I’m scared of anchovies, however. Hmmm… My top 10 might be: onions, garlic, pasta, tomatoes (canned/frozen), olive oil, beans (canned/dried), stock, parmesan (just discovered saving the rinds! ), rice (or potatoes), and frozen fruit. Yes, rice and pasta are definitely part of my list – they just sort of blew my “top ten” theory. Lisa H took my biggest staple – canned tomatoes ! I learned this from my mother-in-law – being she was half sicilian I learned quickly tomatoes,tomato paste/sauce were the staples my husband had grown up with! She taught me in a quick pinch you can take the cheapest of spaghetti sauces, add sweet basil; oregano; and canned diced tomatoes, add pasta to make a tasty meal. Yes, a well stocked spice cabinet may be inspiration for another post. Thanks for the list! I can’t wait until I get my own place so I can plan things out like this, as well. Oh dear! We need to share an easy dish; tuna fish, parmesan, noodles, capers and a lemon. So easy and so delicious. Capers are wonderful sprinkled on bagels with cream cheese and lox! Thank you, Lisa! I will have to try that one day. OK, I’m going to try that out for my mother one day; just saved it in my “recipies” sticky. Thank you! I’m not a plan-ahead menu person (usually not, anyway) but I can always pull together a meal in a pinch. I keep most of the items included on your list in my pantry or freezer at all times. The only thing I don’t stock on a regular basis would be capers. I like to keep plenty of canned tomatoes on hand. My mom cans them from the garden (when we have enough) and I also buy commercially-canned tomatoes (organic, when I can find them on sale). I can always whip up a great meal from canned tomatoes, whatever frozen veggies, fish or meat I have on hand, garlic, onions, spices, and pasta. Yes, I always have pasta and an onion too! Onions, garlic, celery, carrots, tomatoes, green or red peppers, olive oil, beans, veggie bouillon cubes, whole wheat pasta, brown rice, barley, lentils, potatoes, frozen veggies, tortillas, salsa, crusty bread, nuts, and . . . chocolate. Like you, I freeze parmeson rinds to toss into minestrone or vegetable soup. mmmm chocolate. Good addition. I haven’t frozen the rinds though. Thank you Tammy. This is a perfect post for my nutrition class. Mind if I post your link in my class lounge? Thank you for the list Tammy 🙂 God bless you. And you Nooru! Love your blog. I definitely have all of these. My favorite unusual staple is ginger root which I keep in the freezer. I just cut off a chunk whenever a recipe calls for fresh ginger. Freezing ginger? That is new for me but sounds like a great idea. So wish I could help you set it up Debbie. Great post, great list and even greater kitchen! What I love to have always at hand are tomatoes (canned, dried), ginger (frozen), herbs (fresh and then dried for Winter months), broth (meat, fish and veges), anchovy filets, mackerel and tuna tins, smoked trout filets, frozen veges (ready for a soup), beans and lentils, frozen fruits, pasta and rice(s) of course. Thanks for the tips of the lemon and parmesan rinds. I also have tins of tuna. I’ve always loved it and my kids do to. Rice and dried pasta are on my list of must haves. I am a planner too from way back, part of having been a project manager for years. Nice to know I am not along. Yes, both of those are important parts of my system – just beyond ten! Must add frozen fruit to my list, Tammy. What a brilliant standby! And so easy to throw in a blender with yogurt or kefir or soda water or greens! What a great post Tammy. I’m adding frozen fruits to mine and I always keep a bottle of mixed Italian herbs, fresh or dried and canned tomatoes handy. Oh and some fragrant rice too. Yes, I’m going to follow with a spice post. I’ve sort of lost my mustard loving over the years – perhaps I ate so much of it at one point? I agree with everything except the capers and frozen fruit. *Although I seem to ALWAYS have both. I’d replace the capers with canned tuna, salmon and/or clams. I can create quite a meal from those canned little fishies. As for the fruit, there is never, ever a time we are without fresh fruit in our house. That is, as fresh as the grocery store can supply (that’s sometime in question and makes you wonder if you’d be better off w/ frozen?! – kind of like the canned tomatoe discussion). Great post. i should make my own top ten in the pantry list. you should and I struggled with not putting clams on the list. Well, I had to wiki that and just had a fascinating read. Thanks for the comment Hannah – really learned something from you today. Being a squirrel really helps when you’re trying to put a meal together. I’ve recently added a lot of raw components also. I’m a planner as well, and dried legumes, olive oil, nuts, and garlic an be found in my pantry as well! Apart from that, I always have frozen chicken, fish, and lots of vegetables in the freezer, and preferably fresh fruit and vegetables in the fridge. I also have rice protein powder now so I can make a green smoothie when I don’t have a lot of time and need nutrition ASAP. A good list Kath. I keep fish in the freezer also. I think the only thing missing from your list was grains… not a single one? I always have rice, in one form or another, and typically also cornmeal/polenta. Carrots are also essential to my pantry, perhaps even more so than onions! When in doubt, chop some garlic, a carrot, and an onion. I’m not really an anchovy fan, but dried mushrooms can make a pretty good sub for the umani-flavor. Yes, grains. We have many. I just ran out of spaces. And dried mushrooms. I don’t think I’ve ever seen them in Asian or Indian cooking. Great information. I usually only run out of the fresh items. Usually purposely, after tiring of a certain aroma, or taste. But, regardless of how hard I try, there is always either a new product debuting on the scene, or, I am tired of a certain taste, so don’t really plan to use something enough to keep it on a list…Then a few months later I want that flavor…So, off to the Market again. Well, the list was meant more for the “old stand-bys”. Mine really isn’t limited to ten but that’s what I put down. Got everything but the anchovy filets! 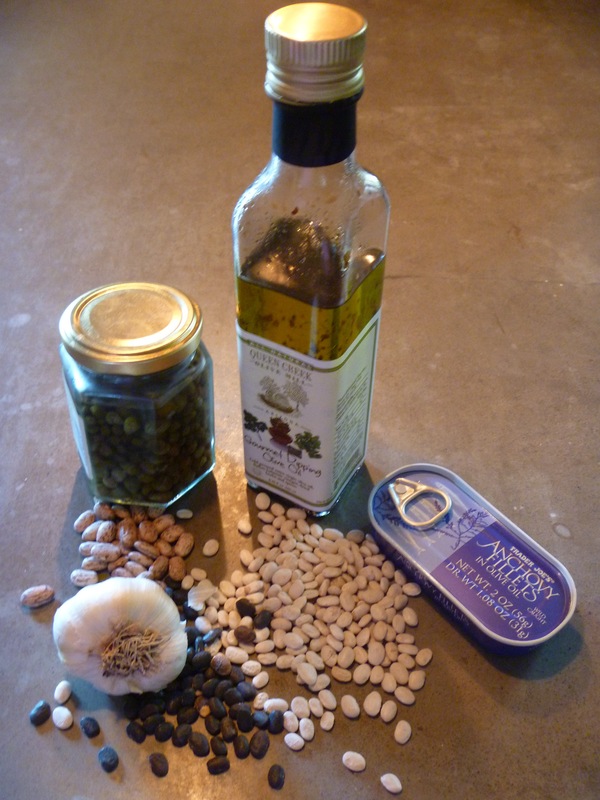 And although I always have capers, I rarely use them. Fish in a tin are an easy add on to anything. Don’t forget canned chicken and turkey breast. Also an easy way to create a quick meal. I love the idea of capers. I’ve never bought them or seen them in the store. Do you buy them bulk, or in a jar or can? I have bought them in a jar and in bulk. I’d start with a small jar if you’re not sure about them. Tammy, what do you do with capers that you keep them stocked? I have only bought them in the past when I needed for a specific recipe, then never to be heard from again! Add them to noodles. I eat fish so I love them with butter and lemon juice over fish. on a bagel with cream cheese. Cooked up with eggplant and raisins and made into a spread. What, on earth, do you do with it? Add to salads? Put in your smoothies? Why is it a staple? I’m with you on the beans & lentils they’re so versatile. One of my favourite quick emergency dinners is roasted vegetables with butterbean puree. I roast whatever veg I have with chilli flakes, garlic, thyme and olive oil. The bean puree is like a mix of mashed potato & hummus. You puree the beans with some roasted garlic cloves, add lemon juice, olive oil, basil & salt & pepper then heat it up. So much easier than potatoes and totally delish!! That sounds like a wonderful dish! I love this list! It sounds like my cupboard. And you have everything you need, except for fresh tomatoes, to make putanesca sauce! i knew i liked you for a reason….anchovy lover! I totally agree about keeping a well-stocked pantry. I always have a variety of lentils, rices, and vinegars on hand, in addition to many of the things on your list. Vinegars are a great add. I also have a variety on the shelf. Great additions! Thanks for coming by my blog. Other stuff is extra –that’s why I didn’t reach 10. On ingredients 1-5 alone, means tremendous variety in Asian dishes by using different techniques. There’s no logic for 7-8 and probably surprising to many people here. Yes, I have plenty of tea and coffee in the pantry too – everything that is on your list except the Asian noodles. Tammy, would you like some of our beans we have grown? Please send me an email and let me know. I would be glad to mail you some. I mail beans all the time.